What to make of Canada’s priorities for the NAFTA renegotiation? 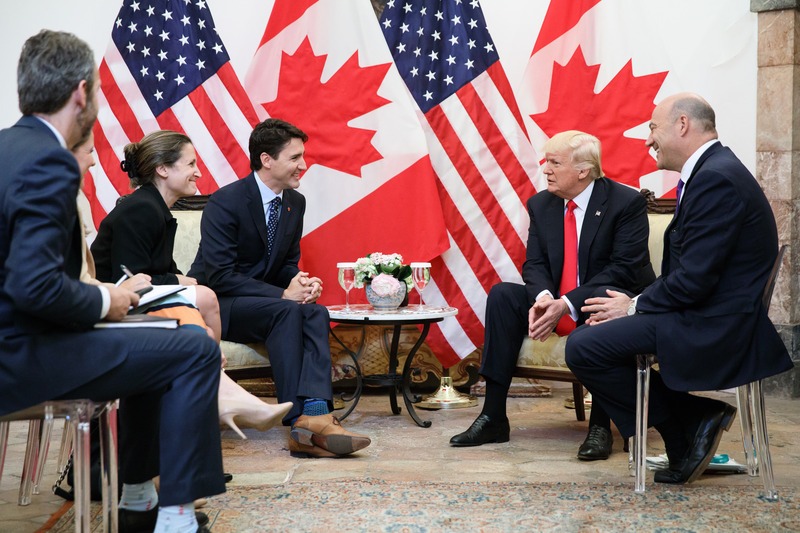 PM Trudeau and Foreign Affairs Minister Freeland meet with U.S. President Donald Trump in May (PMO photo by Adam Scotti). In a series of speeches on Monday morning, Foreign Affairs Minister Chrystia Freeland outlined six broad priorities for Canada in the impending renegotiation of the North American Free Trade Agreement (NAFTA). Freeland’s list was not as extensive as the U.S. proposal released in July, which is to be expected, and with the exception of her proposals for new chapters on gender and Aboriginal issues, it was equally unimaginative. Trump called for NAFTA to be renegotiated, after all, so the pressure was on his trade team to explain what exactly has to change in the deal to make it “fair,” in their view. Canada and Mexico are on the defensive: neither wants to see NAFTA thrown out, but they also don’t want to get rolled over by Team Trump. So what did Freeland tell us? From procurement to regulatory co-operation to labour rights, Canada sees the recently concluded Comprehensive Economic and Trade Agreement (CETA) with Europe as the model for NAFTA 2.0. (Trump won’t, but that’s a conversation for another day.) The Trudeau government has repeatedly praised CETA as the “most progressive” trade agreement in Canadian history and will try to push that model onto the U.S. and Mexico. To be clear, CETA is not a progressive agreement — and this is why we are skeptical of talk about making NAFTA more climate- and labour-friendly. The EU deal was negotiated almost entirely by the Harper government. Had the Conservatives won the election in 2015, they would likely have fronted the same six priorities for NAFTA renegotiation as the Liberals did today. Besides, being the “most progressive” deal in a sea of pro-corporate trade pacts is hardly worth celebrating. In fact, CETA includes a long list of truly regressive elements that continue to be challenged by workers, activists and politicians in Canada and the EU. One of those issues is the chapter on regulatory co-operation. Earlier this year we co-published a report with our European allies exploring how Canadian governments have repeatedly prioritized business concerns over environmental or public health concerns when regulating (e.g. in the areas of toxics, food safety, rail safety and GMOs). Co-operation, in this case, became an excuse for inaction or the adoption of pro-industry regulations. Provisions to “harmonize” regulations through CETA threaten to reduce regulatory standards to the lowest common denominator in Canada and the EU, just as they have in North America. But now we are dealing with a Trump administration that is defunding its environmental regulator, doubts the science of climate change, and wants to scale up fossil fuel production and exports. Is this really the right time to be increasing the amount of regulatory co-operation we do with the U.S.? Freeland talked about the opportunity in the NAFTA renegotiation to “cut red tape” for business. The adoption of deregulated environmental standards across North America could hardly be called progressive. Another key issue is NAFTA’s problematic investor-state dispute settlement (ISDS) mechanism, which gives multinational corporations a powerful tool to undermine public interest regulations–a tool that has been used more times against Canada than either of the two other NAFTA countries. At the trade committee this morning, NDP trade critic Tracey Ramsey asked Minister Freeland directly if ISDS would be removed from NAFTA, but Freeland dodged the question by claiming that governments have a “right to regulate” regardless of ISDS. That might sound like a reassuring answer, but the government also claims the right of governments to set environmental policy is protected in CETA, which it isn’t. An updated ISDS system in NAFTA, modelled on CETA, is simply not good enough. Last month, the CCPA laid out our own priorities for the NAFTA renegotiation in a submission to the government’s consultations. One of them — perhaps one of the most important — had to do with process. We proposed that the NAFTA renegotiation should be inclusive and transparent, meaning that labour leaders, Indigenous communities and other critical stakeholders should have a seat at the table, and that the talks should be public. Instead, Minister Freeland has established a NAFTA advisory council that includes business leaders and partisans from the left and right opposition parties. The panel also includes CLC President Hassan Yussuff and Chief Perry Bellegarde of the Assembly of First Nations, but its benefit (to the government) may be in the impression it creates of a cross-ideological consensus on NAFTA — a consensus that does not really exist. On the surface, the inclusion of the AFN on the advisory council corrects the historic exclusion of Indigenous nations from Canadian trade deals that affect their sovereignty. The same could be said for labour, which historically plays a much larger (if disputed) role in U.S. trade policy than it has in Canada. But this will only be true if the NAFTA council is taken seriously and is not sidelined while business groups get to shape the bulk of Canada’s priorities for renegotiation. Will this advisory council be a real sounding board with privileged access to texts, or merely window dressing on the traditional closed-door negotiation process? Canadians are starting to catch on to just how important image — the narrative — is for this government. In the public communications universe, being seen as progressive can be a victory, even when the government doesn’t follow through with actions (as on funding for the new feminist development policy, Indigenous reconciliation, and especially electoral reform). Like with those other files, we should ask whether the stories the government tells us about progressive trade deals are just that — stories. The proof will be in the government’s actions after the NAFTA negotiations get started on Wednesday. Hadrian Mertins-Kirkwood is an international trade and climate policy researcher at the CCPA. Stuart Trew is a CCPA trade researcher and Editor of the Monitor.